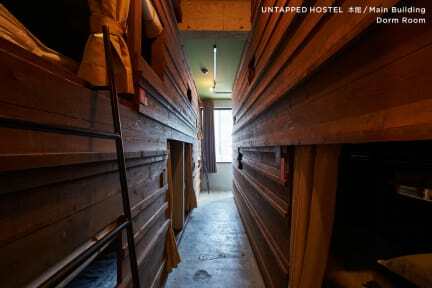 UNTAPPED HOSTEL is located only 1min walk to the closest station., 10mins from Sapporo station. by subway and accessible to the popular destination 'Otaru' by bus. Enjoy our uniquely designed private bunk bed and home made breakfast! Conveniently located in Hokkaido university and surrounded by the beautiful nature. We fully renovated an old building used as an eel restaurant by ourselves and turning it into a warm and cozy space filled with features of Hokkaido. We have three unique dorm rooms. Each bed's form is like a capsule and make you feel in a private room.One of the room is female only. There is four private rooms as well. If you would like to book one of these, please contact us via e-mail. 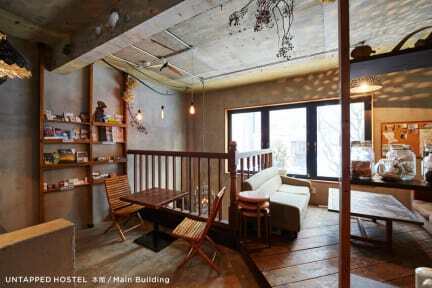 On the 1st floor is a long established restaurant called 'GOHANYA HARUYA' that has a history of over 20years. The restaurant serves original homemade Japanese dishes and a few selected Nihonshu.The other liquors as well. UNTAPPED HOSTEL serves homemade bacon cheese toast as breakfast / ¥500. Please reserve it when you check in if you like.